It has been rainy today, dull and grey – so a perfect day to spend time in a warm kitchen baking goodies! I made hot cross buns (or hot non cross buns as I like to call them, we didn’t pipe crosses on to our buns, the recipe suggests Darwin fish but we couldn’t manage that!) 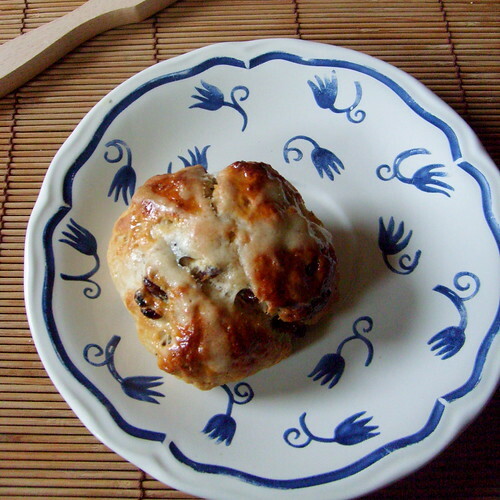 from a recipe I found on Gastronomy Domine (my first food blog find!) and potato and sour cream bread from my newest blog find – The Knead to Bread. I’ve never baked my own hot cross buns before, and I have been missing out all this time! They take a while to make, because you need two long proves but they are worth it at the end. The house smells amazing even now, and they are so much softer and fresher than the supermarket version. We had potato and sour cream bread rolls with chili con carne tonight. 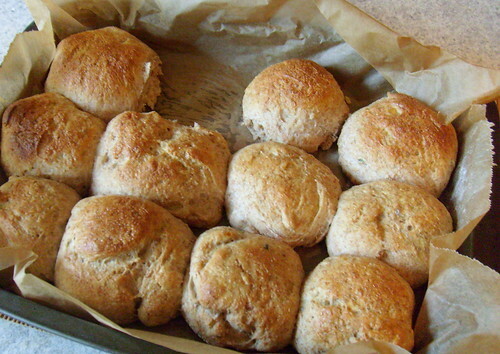 The rolls were great, I though they would be stodgy like I imagine potato bread to be, but they are light and fluffy. Again, they take a long time to make but they are worth it in the end. We have 12 rolls and a loaf too!